was an Eccentric Japanese painter of the mid-Edo period when Japan had closed its doors to the outside world. Many of his paintings concern traditionally Japanese subjects, particularly chickens and other birds. Many of his otherwise traditional works display a great degree of experimentation with perspective, and with other very modern stylistic elements. Though compared to Soga Shōhaku and other exemplars of the mid-Edo period eccentric painters, Jakuchū is said to have been very calm, restrained, and professional. He held strong ties to Zen Buddhist ideals, and was considered a lay brother (koji); but he was also keenly aware of his role within a Kyoto society that was becoming increasingly commercial. A much-anticipated harbinger of spring, the cherry blossom is also exemplary of the Japanese artistic aesthetic - a delight in simple, natural beauty and an attentiveness to the changing seasons. This spring will mark the centennial of Japan's gift of three thousand cherry trees to Washington, DC, and this sumptuously illustrated catalogue is the companion to a celebratory exhibition at the National Gallery of Art featuring the work of Ito Jakuchu. Jakuchu (1716-1800), a wealthy wholesaler and talented painter, is, in Japan, the most recognized artist of the premodern era. His thirty-scroll set of bird-and-flower paintings titled "Colorful Realm of Living Beings" is a renowned cultural treasure, one of the most beautiful and skilled examples of how the natural world is depicted and symbolized in Japanese art. Presenting gorgeous flora and fauna in meticulous detail, the scrolls are reunited here with Jakuchu's triptych of the Buddha Sakyamuni from the Zen monastery Shokokuji in Kyoto. This stunning volume reproduces these masterpieces of Edo-period art and complements them with extensive background material on their significance. Recent conservation of the scrolls has revealed new information about the materials and techniques used by Jakuchu, and those findings are discussed in the volume, offering a multifaceted understanding of the artist's virtuosity and innovation as a painter. 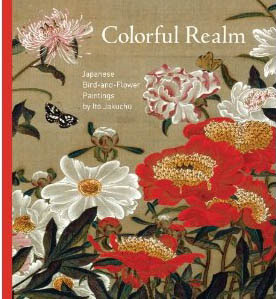 As the first English-language examination and overseas display of Jakuchu's Colorful Realm in its entirety, the book and exhibition will offer new audiences a chance to encounter this landmark work-generously lent by the Imperial Household Agency, Tokyo. This spring, Washington, DC, marks the centennial of Japan’s gift of 3,000 cherry trees to the United States with three extraordinary exhibitions of Japanese art. The Freer and Sackler Galleries present Hokusai: Thirty-six Views of Mount Fuji, featuring the most famous print series by Katsushika Hokusai (1760–1849),and Masters of Mercy: Buddha’s Amazing Disciples, with selections from a seminal ensemble by Kano Kazunobu (1816–1863). a rare opportunity to view one of Japan's most renowned cultural treasures. Flower-and-Bird Painting already appeared in the remote past of China. Patterns of flowers and birds on pottery, bronze vessels and phoenix paintings on silk during the Warring States Period (7th-4th centuries B.C), were the early indications of the Chinese’s people interest in such themes. These ancient patterns and images were rather simple and plain but they slowly developed into a mature and important genre of art with a variety of highly developed techniques, schools and a well established theoretical background. Flower-and-Bird Painting did not become an independent art form until the mid and late Tang dynasty around the 8th and 9th centuries, it is interesting to see how this form of art slowly “creeps” from the background of initially serving as ornamental pattern for daily utensils, later serving as symbolic, metaphoric and allegorical elements in the background of figure painting and all the way to the final stage where we see flowers and birds as independent themes. 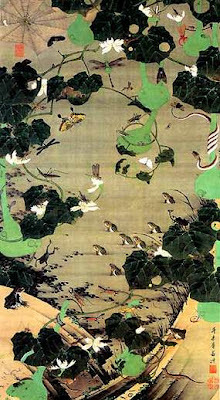 In pre-Tang and Tang Dynasty figure paintings we see birds and flowers symbolizing the mood and temperament of the human figures depicted, the characters seldom directly look at each other, instead there is a relationship with a flower they hold, a tree they sit beside or with the birds that fly around them. At this stage of development, flowers and birds serve as symbols, this is a further development from the ornamental function they had on bronze wear and pottery. This symbolic function was certainly an important stepping stone on the way to become an independent art form during the mid and late Tang, and indeed, Flower-and-Bird Paintings preserved their symbolic role and must be observed and enjoyed in this context. The tradition of Flower-and-Bird-Painting evolved into two main trends, namely the Gong Bi tradition where artists focused on small details, careful application of color and meticulous technique, giving their art a realistic and ornamental feeling. This tradition evolved through the influence of the Huang family mentioned above, while the other trend of Xie Yi which was more expressionistic and impulsive, stemmed from Xu Xi who was the two Huang’s contemporary during the Five Dynasties Period.
. Zen Mind Zen Brush .
. Vegetables entering Nirvana .
. Soga Shohaku 曽我蕭白1730–1781 .